Mile Markers: I Love Revival! I love revival. I love it wherever I find it and in whatever doses I can get it. I especially love revival under the tent and I love it even better when lives are being changed and touched. That is going on this week! We will probably have a Revival In Pictures post tomorrow. Today I want to give you a report on the tent revival so far in Amber, Oklahoma. God is meeting with us in these services. Not one service has been a dud. I always love revival under the Blue and White Gospel Tent, but this revival seems to be especially good. What makes the difference? God has to be involved, we know that, right? If God is not involved we are wasting out time and spinning our wheels. Revival must be part of a sovereign move of God. However, I believe revival in these last days is the will of God. I believe God is ready to move on and through and among His people without a moments notice. I am of the firm opinion that we are not waiting on God to send revival, but that God is waiting on us to desire revival enough to prepare for it. 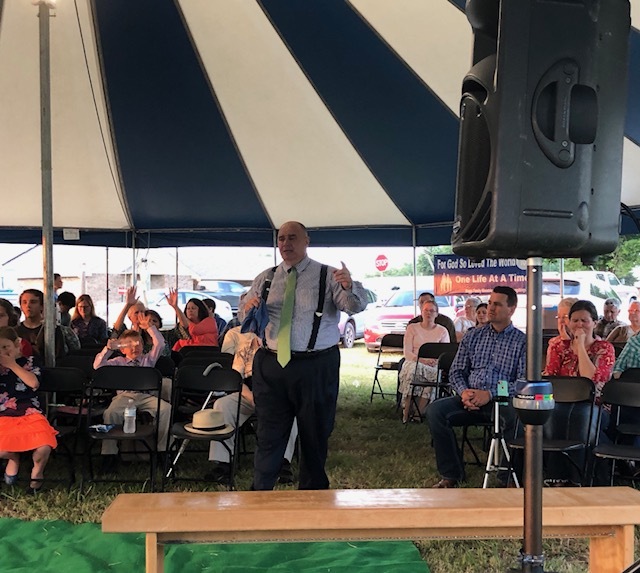 The folks at Amber Mission Holiness Church, under the direction of Pastor Russel Cheek, have done their dead level best to prepare for revival. They are seeking God. They are sanctifying themselves. They are reaching out to the community. God honors that. God brings healing, deliverance, salvation, victory, peace, joy and a thousand other good things to people when they desire Him to do so. I love it and I am seeing it happen this week right before my very eyes. We enjoy walking right smack dab into the middle of a revival atmosphere. It is good, good, good to breathe the fresh air of revival this week. Another good thing is this. Tent Revival is not over yet! We have two more nights and I can not wait to see what God is going to do next. I know this much. It is going to be good.